All On 4 Dental Implants in Bakersfield are designed to replace a full mouth of teeth implants without the patient having to endure several dental implant surgeries. They are non-removeable teeth that are supported by a full arch to ensure their durability. In the end, a patient will receive natural appearing prosthetic teeth that work like their original teeth. The implants are life-altering as they provide a more natural appearance and help them retain the ability to speak correctly. Plus, as a durable implant, the individual can still enjoy the food they have always loved to eat. 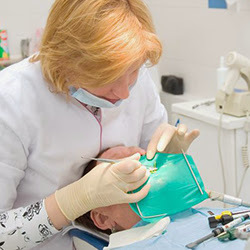 At Backer Dental Laboratory, they offer the services and products that a dental clinic requires to deliver the quality care their patients deserve. For over 25 years, they have stayed on top of the latest technology available to create customized dental prosthetics used to enhance a person’s smile. You can reduce the amount of chair time your patient experiences when you work with them for all your prosthetic needs.